It's easy to set goals, but do you know how to achieve them? We live in a time of to-do lists, bucket lists, 1, 3 and 5 year goals, and lots and lots of tasks that we set for ourselves. But what do we do with all of these plans we made? How do we bring them to fruition in our lives? How do we actually become goal achievers and not just goal setters? I was having this very conversation with a friend of mine and as I was explaining to her my process, I realized that not only was my process doable by just about anyone. It was something I had discovered early in life during my high school years! Below I share these simple steps that have helped me go from being just a goal setter ton an actual goal achiever! I know this step seems obvious, but you would be surprised at how many people actually skip this first step. When I talk to people about their goals, they often tell me their ideas or things that they would like to do. Most of the time they haven’t taken the time needed to sit down and get all of those thoughts and ideas out of their heads. 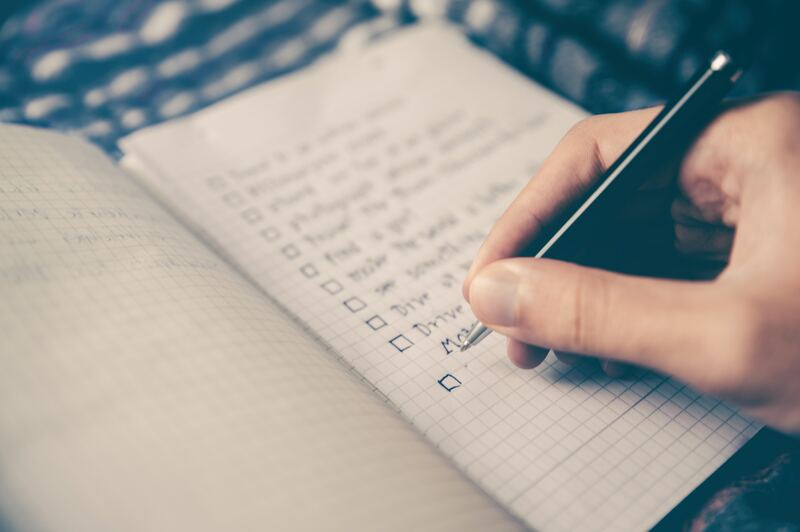 One thing I like to do is sit down and create a list of all of the ideas, thoughts, goals, and well anything that I would like to do or create. There’s no particular order that I do this in, and I don’t use a certain tool for it. Sometimes it’s as simple as pen and paper. This process helps you to see all of the things that have been clouding your mind. It’s possible that through this process you will begin to notice a theme for your goals, like health, family, or career. Once I have everything in front of me, I determine what I like to call “do-ability”. This is the process of determining how likely you are to DO those things you have written on your paper and how long it would take YOU to complete them. This is not a long drawn out process. You know yourself better than anyone, and you also know if you are likely to complete the goals you are setting for yourself! The final part in setting the goal is where I prioritize the goals by time to achieve and relation. For instance you may have the goals to lose 15 pounds, eat healthier, start a blog and write a book. Well I would prioritize them in this order: eat healthier, start a blog, lose 15 pounds and write a book. Why? Because if you begin eating healthier eventually you will lose the 15 pounds and if you start a blog, eventually you will have enough material to write a book! Now that you have your goals let’s move on to the next step.. This part of the process is easy for those who like to plan and organize, but for those who are great at setting goals, this is the hardest part! Planning your path isn’t just about creating a step by step process. When I was in high school, I had the desire to run for President of the United States (true story). This became my goal. I knew what I wanted to accomplish but I did not know how to get there. So what did I do? I researched! During my research I found that many who had gone into politics had a background in law. So I decided the best route for me to become President was to go to law school and become a lawyer. Of course that would mean undergrad, so I decided that I would get a degree in Political Science. Unfortunately, my further research found that in the event I did not make it to law school, a Political Science degree would not offer me the career choices that I would enjoy, so I decided I would have to double major. This led me back to where I was, in High School. Do you see what I did? I backward planned. I determined my goal. Researched what it would take to accomplish it, and planned a path to get there. This can and should be done with any goal! You could set out to accomplish your goals without a plan, but I’m sure you’ve already tried that. Most people don’t plan because they don’t know how, while others fail to plan because the assume it won’t succeed. Don’t be either of these people. Instead set your goal, create your plan and proceed to the next step! I know this part may seem obvious, but this is where our hopes and dreams often get lost. We set a goal, create a great plan to achieve it and then we fail to execute the plan. This is where having accountability partners and a support system in place come in handy. Accountability partners come in the form of significant others, family members, friends, mentors, coaches, etc. The simple act of voicing your plans out loud to another person, will put an extra layer of importance on that goal! I remember when I would work out on my own versus when I was working out with someone outside of my household. It’s easier to tell yourself, “I’ll go later” than it is to roll over in bed knowing your friend is waiting for you at the gym at 5am in the morning. Having that extra person involved in your goal helps limit that self sabotaging behavior. When it comes to executing the plan, the bottom line is that you have to at least make the effort in accomplishing the goal. If you are always setting goals, planning and scheduling them, but never actually doing what is necessary to accomplish them, you will always be in the place you have always been. This is the final step in the goal achievement process. I added this as a step because the cycle would not be complete without it. If you’re having trouble achieving goals, try this process but start with a small goal and after you accomplish it, rinse and repeat. The next time..go big! (I live in Texas..) Success breeds success. Once you see that you can accomplish the small goals, you will be tackling your larger ones in no time!